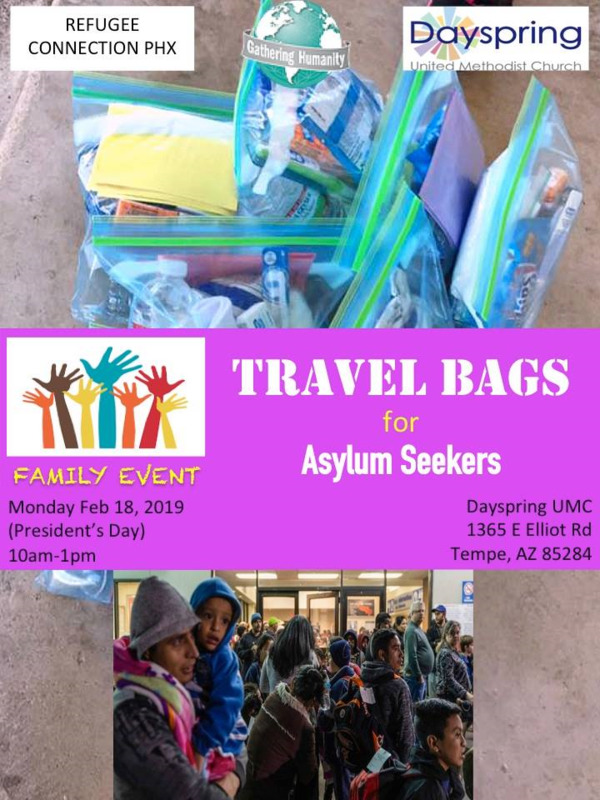 Refugee Connection Phx is partnering with Dayspring UMC to collect supplies and assemble travel bags for Central America asylum seekers to ease the journey to their destinations. These families were forced to leave their homes in Honduras, El Salvador and Guatamela - countries with one of the highest murder rates in the world, gang recruitment, and violence, to seek refuge in the US. Head of households outfitted with GPS tracking device, the families are sheltered in local churches for 1 or 2 nights with food and shower then dropped off at bus station or airport to head to their families within US while waiting for their asylum cases to be heard in the court. Bring your entire family for a few hours of service! There will be stations for making hygiene kits, snack kits, toy kits and assembling complete bags. We will make backpacks for adults and teenagers and drawstring bags for kids. These bags will be given to the families at hosting churches to fill with clothes, etc. 1- Bring 1 backpack (new or used) per person - ie. If mom and 2 kids are coming, bring 3 backpacks. 3- Sign up for filler items at https://www.signupgenius.com/go/20f084fa9a72ea5ff2-travel1. The specified quantities are needed to provide 1000 bags. Items have been selected with lowest-price in mind and can be bought at suggested stores and Amazon http://a.co/7W6Qhgq. Amazon items will be shipped directly to Dayspring. If you purchase from the store, please drop them off at Dayspring before Feb 18 if possible. If you will bring donated items on Feb 18, please come at 9am so that we can place your items in the appropriate assembling stations. Please, please DO sign up below so that we know all needed items have been picked up. To sign up, click on the Sign-up button next to the item. If you do not have a Signup Genius account, it takes a few seconds to create one. You will be sent a reminder email. If you’d like to help but are unable to join us on Feb 18, you can order the much needed items off Amazon or donate money and we’d be happy to purchase the items for you. If you are here reading this note, it means you CARE and THANK YOU. We all CAN do something to help.